The connection between the Brudenell Estates and the name Tresham is steeped in history. Deene Park has been the home of the Brudenell Family for over five hundred years and over fourteen successive generations. 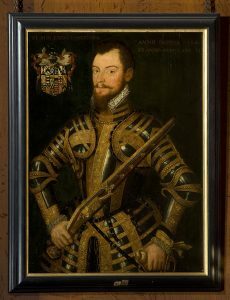 Sir Thomas Tresham (1543 – 11th September 1605), a prominent Catholic landowner in Elizabethan Northamptonshire, was the creator of three notable buildings in Northamptonshire. The extraordinary Rushden Triangular Lodge is a testament to Tresham’s Roman Catholicism: the number three, symbolising the Holy Trinity, is apparent everywhere. There are three floors, trefoil windows and three triangular gables on each side. Each of the three outside walls measure exactly 33 feet long. The inscription ‘Tres Testimonium Dant’ (‘there are three that give witness’), a Biblical quotation from St John’s Gospel referring to the Trinity, adorns the front of the building. It is also a pun on Tresham’s name; his wife called him ‘Good Tres’ in her letters. His sense of civic responsibility in local society, occasioned by his geniality and the expectations of his rank and family practice led him to begin building the Market House at Rothwell in 1577. The third of his notable builds is the Lyvedon New Bield. The exact date of construction is unknown but can be estimated to circa 1604–05, the year of Tresham’s death. The New Bield was on the estate of Tresham’s second home, Lyveden Manor House, also known as Lyveden Old Bield. New Bield also embodies a religious design full of symbolism. Designed on a plan reminiscent of a Greek cross, the facades have a strict symmetry. The building has two floors above a basement, with mullioned and transomed windows. Each floor had three rooms with a staircase in the south projection of the cross. Religious friezes decorate the exterior of the building. The metopes contain the same emblems and motifs as at the triangular lodge. Well read, Thomas Tresham dedicated much of his life to collecting books. The Tresham books formed the basis of the Tresham/Brudenell library kept at Deene Park, which was given us a dowry when his youngest Daughter Mary Tresham married Thomas Brudenell. Read our Blog: House Blog | Restoration: The Brudenell Tresham Library for more information. Mary’s Brother Francis Tresham was involved in the Gunpowder Plot of 1605. As a consequence of this and her husband’s faith, the Family continued to pay huge fines for their beliefs. Life was incredibly difficult for Mary. She had two Sons and a Daughter. 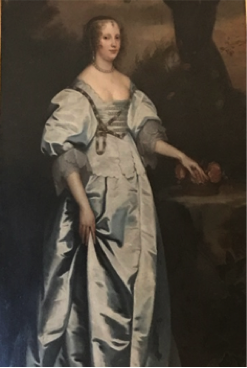 Her eldest Son was kidnapped on the way to the continent for his grand tour and negotiations for his £3000 ransom took two years to complete. Her youngest Son Edmund was captured at Naseby and died several years later at Newby jail. Her husband disappeared to Wales, but was handed over to the Cromwellian Troops at Hereford and imprisoned in the Tower of London. Deene Park was sacked by the Cromwellian Troops in 1643 and the library, the furniture, the paintings and most of the contents went. She was left shivering at Deene and allowed to live off a fifth of her income after fines for being Catholic and a Royalist were levied. Mary’s tenure at Deene was one of enormous bravery without the knowledge of the whereabouts of her family and of huge discomfort and penury.